More than 20 researchers from Huntsman Cancer Institute (HCI) at the University of Utah made their mark on the American Association of Cancer Research (AACR) Annual Meeting this year. Held in Washington, D.C., the convention drew more than 21,500 cancer researchers from all over the world. 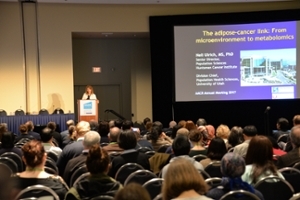 Scientists attended sessions on topics from immunotherapy to precision medicine. About 15 researchers from HCI presented posters in the main conference hall, on a wide range of topics. Ten scientists and doctors from HCI were also invited to speak at the meeting. Pediatric oncologist Joshua Schiffman, MD, served as a panelist addressing new childhood cancer predisposition screening recommendations, which are expected to be published in the coming year. Schiffman was one of 65 doctors and genetic counselors chosen to define the new recommendations as part of the AACR Childhood Cancer Predisposition Workshop held last October. To make the job easier, participants broke childhood cancer disorders into nine categories. Schiffman was an organizing committee member for this workshop, and oversaw the grouping of neuroendocrine tumors. cancer risk. To date, thirteen types of cancer have been linked to obesity, making it second only to smoking as a cancer-causing exposure. Studying fat tissue has provided groundbreaking insights. “What happens during obesity is that the fat tissue itself can directly excrete substances that are carcinogenic,” Ulrich explains. “Some of the tumors we know, for example colon cancer, will sit right next to fat tissue. So if you have a tumor that’s surrounded by fat tissue, you may have direct impact of the fat tissue on your tumor.” Ulrich says these substances may drive the tumor to grow and survive. These excreted substances can also feed into the blood stream, where they float around and increase inflammation in the entire body. That can impact tumors anywhere in the body. “The more fat people get, the more inflammation they have in their body,” says Ulrich. “It’s presumably driving tumors to grow. These inflammatory substances can also help create blood vessels to the tumor and probably help foster its growth.” Researchers don’t yet know whether this inflammation impacts cancer metastasis. The AACR session from HCI Deputy Director Sunil Sharma, MD, proved to be very popular. AACR had to create an overflow room for his talk on LSD-1 inhibitor drugs, which are just starting to be used in numerous clinical trials across the country. LSD-1 is an enzyme that acts like a stem cell regulator. Sharma explains, “The expression of LSD-1 is highly upregulated in various cancers: high-grade prostate cancers, bladder cancers, neuroblastoma, sarcomas, lung cancer, and breast cancers.” So inhibiting that enzyme activity with this new classification of drugs is demonstrating promise. Sharma detailed an HCI study where scientists studied the effects of LSD-1 inhibitors on Ewing Sarcoma, a rare childhood and young adult cancer that often begins in the bones. He explained that when researchers implanted this cancer in mice and then treated them with LSD-1 inhibitors, they saw the sarcomas disappear. He also gave updates on the drug in other cancers. He described how knocking down LSD-1 in Acute Myeloid Leukemia (AML) creates an inability of the cells to form leukemia stem cell colonies, and told how LSD-1 inhibition has anti-tumor activity in prostate cancers and small cell lung cancer. 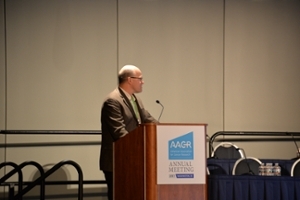 In addition to these AACR speakers, HCI gastroenterologist Jewel Samadder, MD, presented a speech on recent advances in precision prevention for inherited GI cancer syndromes like Familial Adenomatous Polyposis (FAP) and Lynch syndrome, which put people at greater risk for colon and other cancers. Researcher Alana Welm, PhD, talked about how well mouse models represent the human disease when human tumors are implanted in mice. And scientist Sean Tavtigian, PhD, presented the latest research in the hunt for new colorectal cancer inherited susceptibility genes. Researchers Donald Ayer, Jody Rosenblatt, and Andrea Bild, PhDs, also all gave hour-long speeches as part of the Meet-the-Expert sessions that took place in the early mornings. Ayer talked about how cancer cells sense and adapt to changes in nutrient status, Rosenblatt addressed how the expulsion of epithelial cells drives cancer formation, and Bild focused on how whole genome DNA sequencing can define genetic events in cancer cells over time. Overall, it was a successful meeting with more HCI speakers than ever before. HCI’s CEO, Mary Beckerle, PhD, served on the AACR program committee.